The Beautifully landscaped Highway from Noida ( an industrial suburb of New Delhi, India) to Greater Noida is a Classic Example of an Urban Forest amongst Skyscrapers and Industrial Factories. Announcing the arrival of Basant Panchmi ( Spring) are these Clusters of Jewels which adorn the leafless Trees of the Indian Coral Tree ( English), Parijat ( Hindi) ,Erythrina indica ( Scientific Name). Native to India , The Indian Coral Tree belongs to the Pea family or Fabaceae. Adorning the ends of each twig are these brightly Coral coloured blossoms which contrast beautifully against their leafless branches. As the seasons change , new leaves will sprout on the deciduous branches of The Indian Coral Tree. The Inflorescence is a cluster of Brightly Coral coloured Blossoms each of which flexes its spine and Curves upwards towards the Blue Skies and the Sun. Do the Jewels resemble a Tiger’s Claw?? The Corals are not unprotected as they have sharp spiny thorns along the branches. Is the Tree called The Tiger Claw because of the beautiful Blossoms or the Spiny thorns, both of which resemble the Curved Claws of a Tiger ? If you live in the vicinity of New Delhi or are visiting, be Enchanted and take the Slow lane on the Highway to Greater Noida . Be Witness to these Jewels amongst the Trees, which are adorning The Indian Coral Tree this February. It is almost thirty years since I first traveled to Japan. 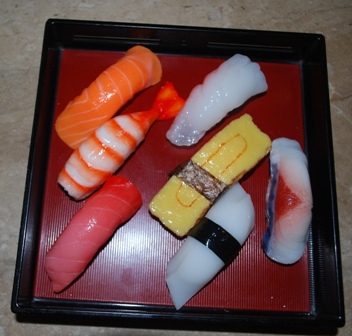 Had never heard of Sushi , let alone any other Japanese food type. 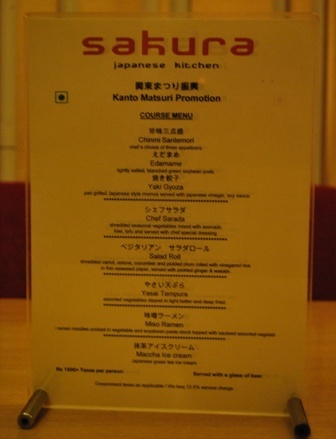 How the world has changed, Japanese restaurants have mushroomed in my hometown of New Delhi. 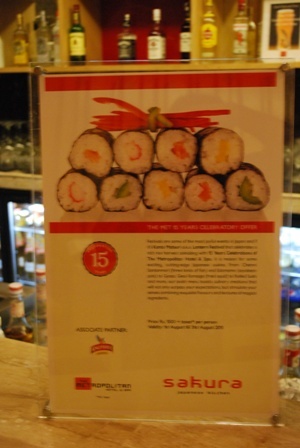 Sushi has become a mainstay of all buffets in fancy hotels and a must like for all socialites ( read Page 3) . 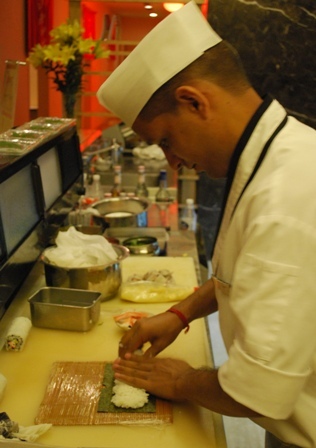 I have even seen Sushi bars in the malls. 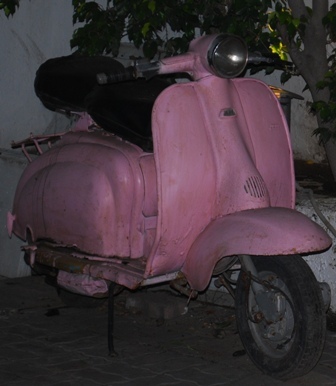 Is the day far when they are available along with momos at every street cafe ? 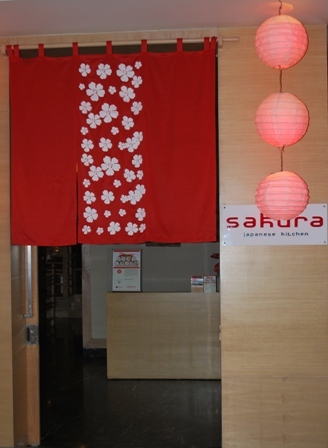 Now in Sakura, New Delhi celebrating “Kanto Matsuri” , the pole lantern festival . 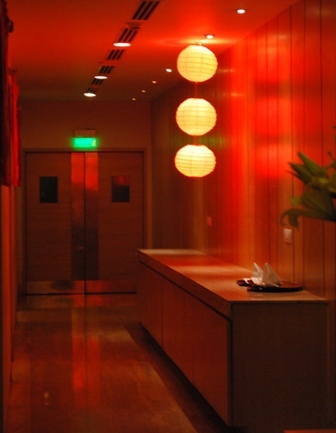 The Red Lanterns and colour red seem to be the main theme of this restaurant serving Japanese cuisine, located on the first floor within the Metropolitan Hotel , New Delhi. 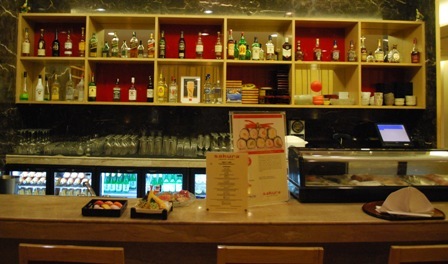 A well stocked bar with the sea food prominently displayed on the counter. 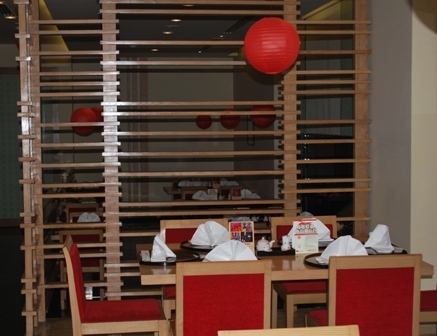 We were however the ‘only foreigners’ in this restaurant, all the tables were occupied by Japanese guests. An introduction to the festival of lanterns and the menu( by the talented chefs ) for the evening was placed on every table. 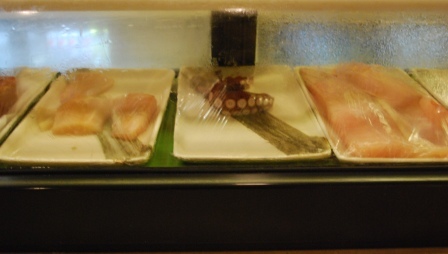 A unique feature in many parts of the Far East including Japan is the display of “faux food”. Thus only for looking, not eating . Sea Food is a cornerstone of Japanese cuisine . 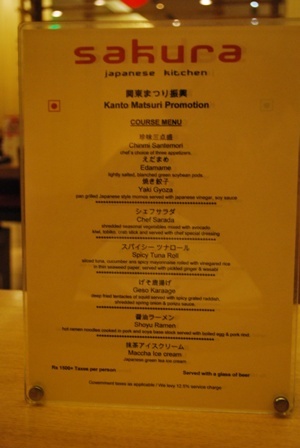 The various types are displayed in the restaurant . salmon ( peach coloured) is on the extreme right. 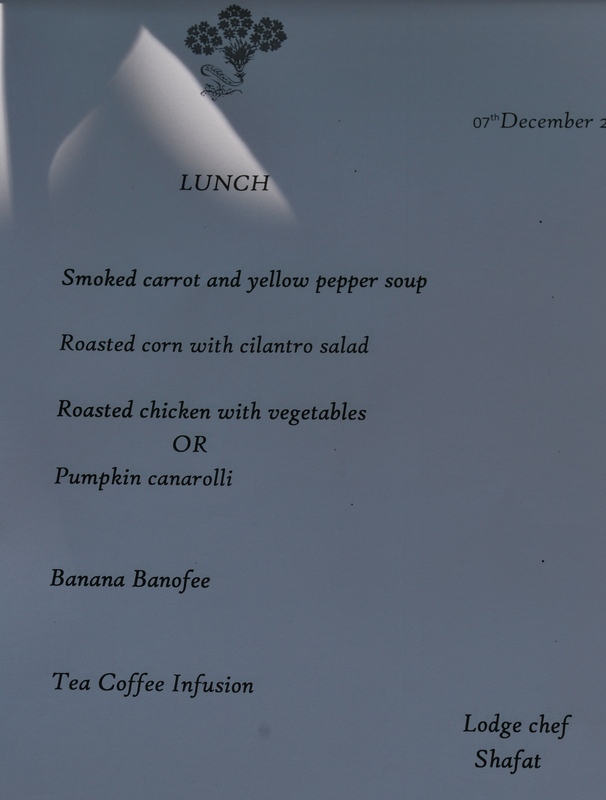 The vegetarian and non vegetarian menus.I kept a careful watch so as not to miss a course. I love Edamame beans.The tofu ( extreme left) was super soft and simply melted away in the mouth. 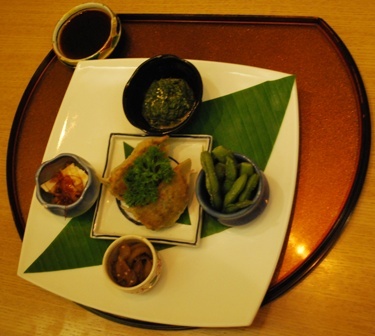 Japanese momos ( Yaki Gyoza) are in the centre. 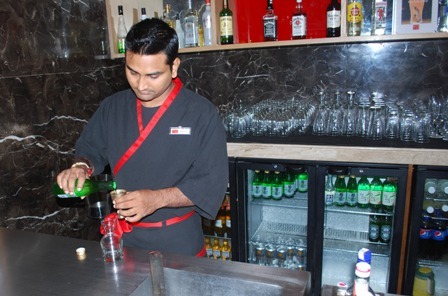 Can any food be complete without drinks ? Beer seemed to very popular amongst all the guests. The sauce with the salad was fantastic. Sushi has become the chic food now. 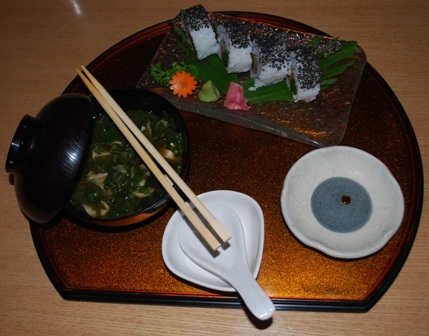 The Miso soup was a surprise add-on by the chef . It was not listed on the printed menu. 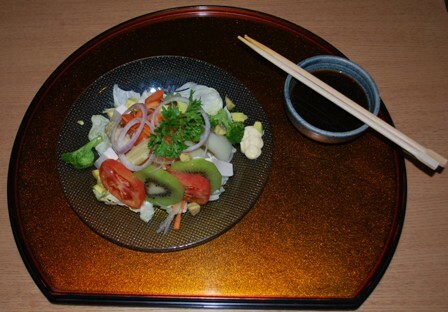 Japanese cuisine is always aesthetically presented and looks like a piece of art. 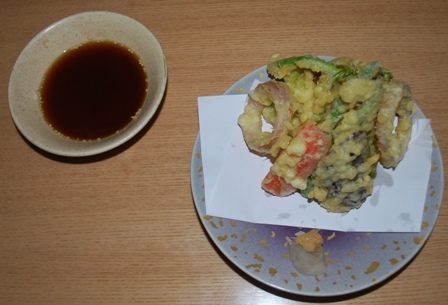 The tempura. ( similar to the Indian pakoras) Did the faux tempura look better? Please do comment. 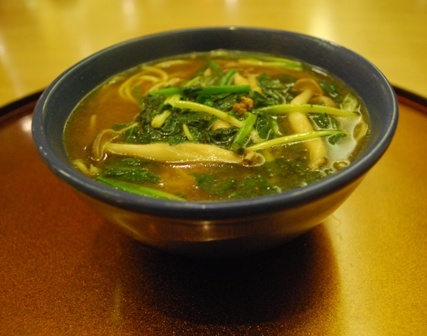 Hot noodle soup or Shoyu Ramen. I was ready to burst. Skipped the ice cream and the tea as well.But you can have it. Am taking you to Heaven. Travel with me, hop on. Watch out for series of blogs this weekend. It is 9 steps to … what to say…but HEAVEN. First and foremost are these wonderfully coloured Modes of Transport. As mentioned in a previous post, Indian highway are a visual delight. 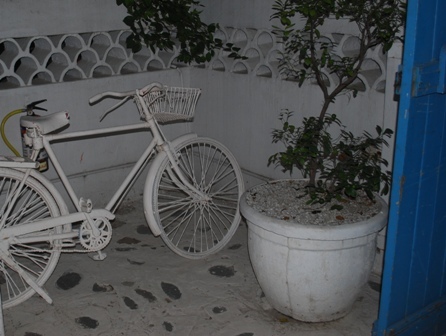 These pictures were captured at a place called WAI ( not WHY) , off the MUMBAI EXPRESSWAY. 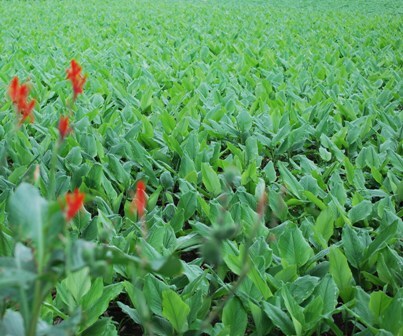 I was soaking in this gorgeous sight of a TURMERIC field, with a few wildflowers in the foreground when…. ……this lovely bouquet caught my attention. 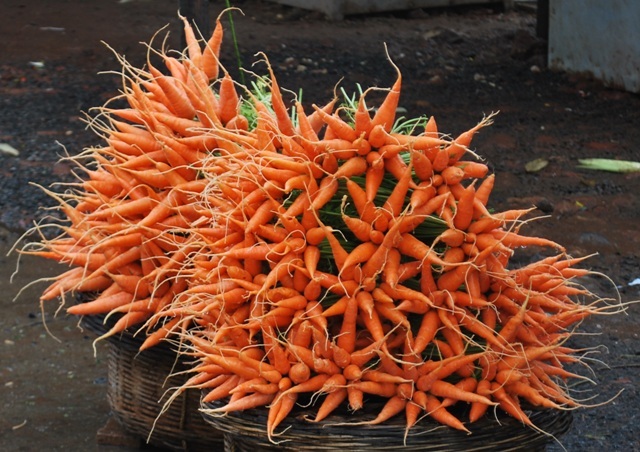 Dedicated to The artists behind this BOUQUET OF CARROTS . This for me is ART. 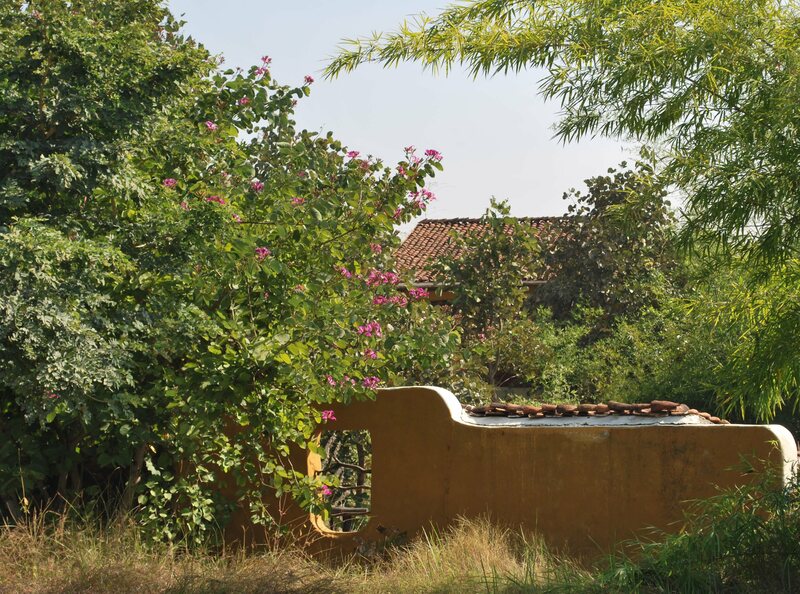 This is the third in the series on Bandavgarh: LUXURY, VILLAGE & THE TROPIC OF CANCER .AS is human have not set off to the village from the lap of luxury. Digressed a bit into Paintings & Artifacts. Though i think now , I shall make it a part of each place I visit as I loved the diversion. 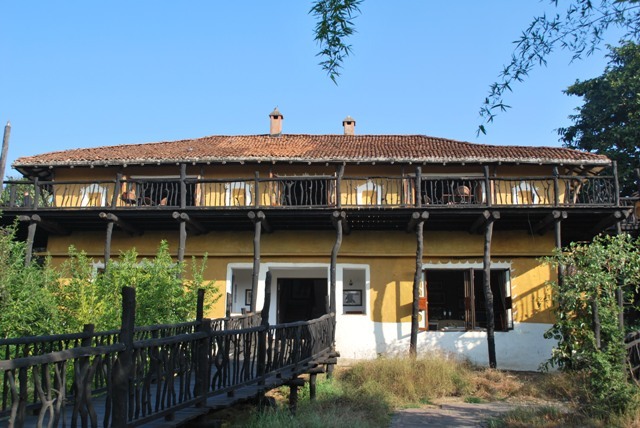 However they were are so fascinating as they reveal stories ( fact and mythical) of the past. While you carry memories of the forest with you in the form of pictures or thoughts, artifacts on the other hand can be placed in our homes. 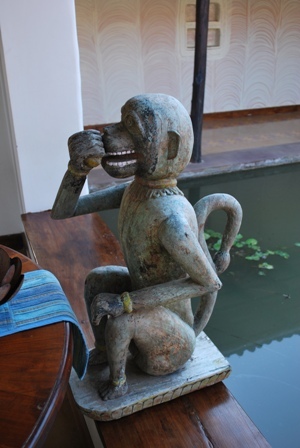 The Artifacts are but a few of the treasures you can see at this resort. Most of them bring to the fore the rich heritage of the region and the arts and crafts practiced by the skilled craftsmen who reside in Central India. 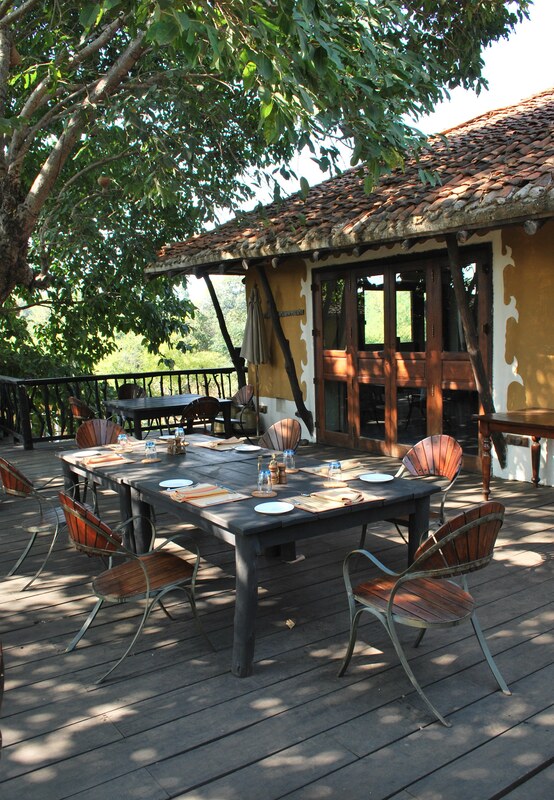 The Samode Safari Lodge is one of the very few and rare places which merges beautifully in its sylvan surroundings. I relive the moments as i take you for a tour. The stone wall, quaint windows and terracotta roof of the GUARD ROOM at the entrance to the sprawling property. Do check the features which draw entirely from the neighboring Village”Mardari “( feature follows in subsequent blog). 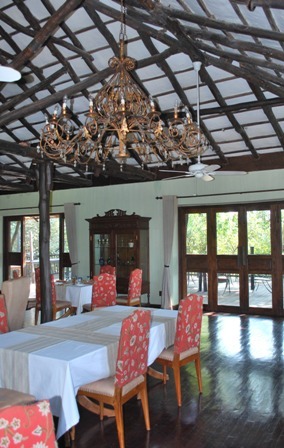 The principal or main building has two levels with the lobby, reception , bar ( watering hole) , fireplace on the first floor. Striking similarity to my office table. This is the reception. Mark the high techie typewriter and other nick knacks.The red books ( “Bahi”) are the traditional accounting books of the local businessman. 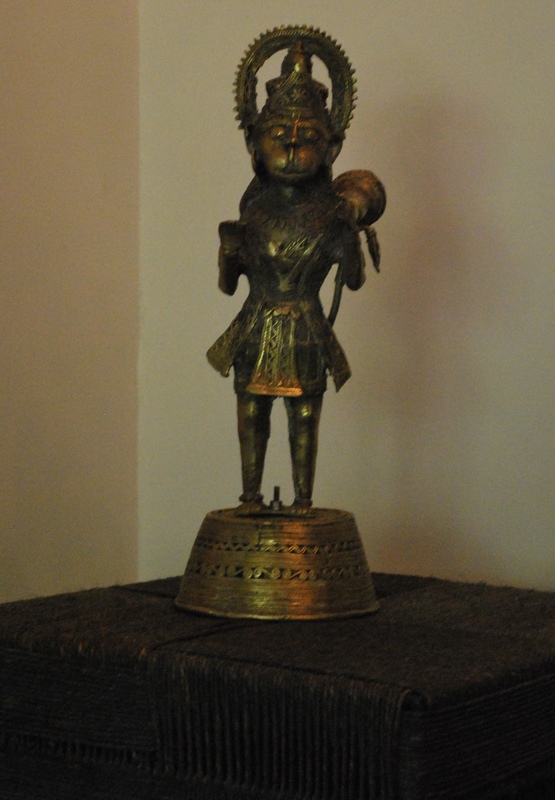 Not a trophy, its made of brass by the Tribal craftsmen of Chattisgarh. Bulk of the artifacts relate to the forest. Most homes in the village have an auspicious drawing/ saying on the exterior front walls. 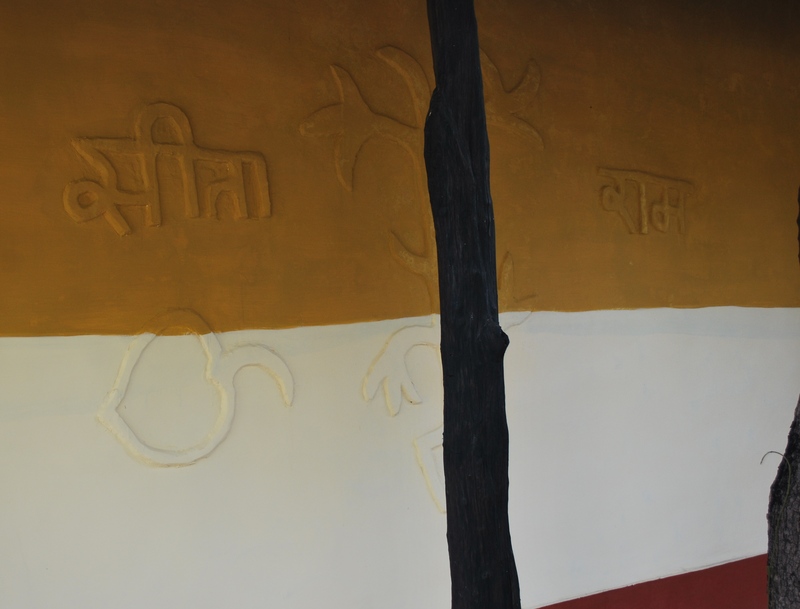 This one reads SITA RAM and is inscribed on the walls of the cottages. Inside view from the rooms keeps you connected to the forest outside . 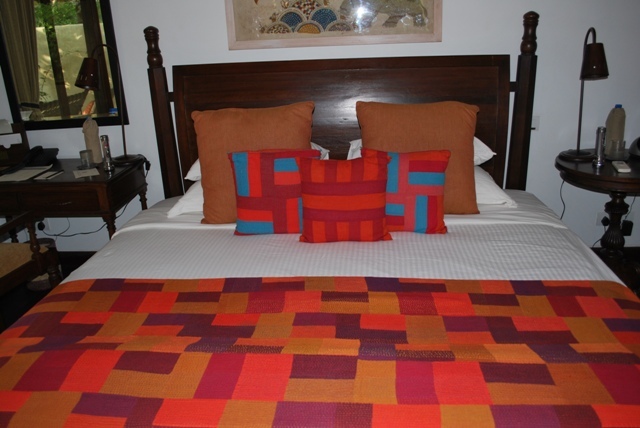 Tastefully done bedroom. 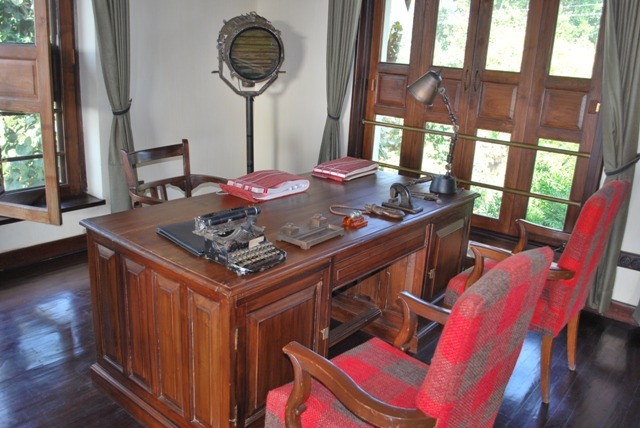 Do note the bedside lamps.Do see the earlier article/blog where there are additional pictures of the cottages. 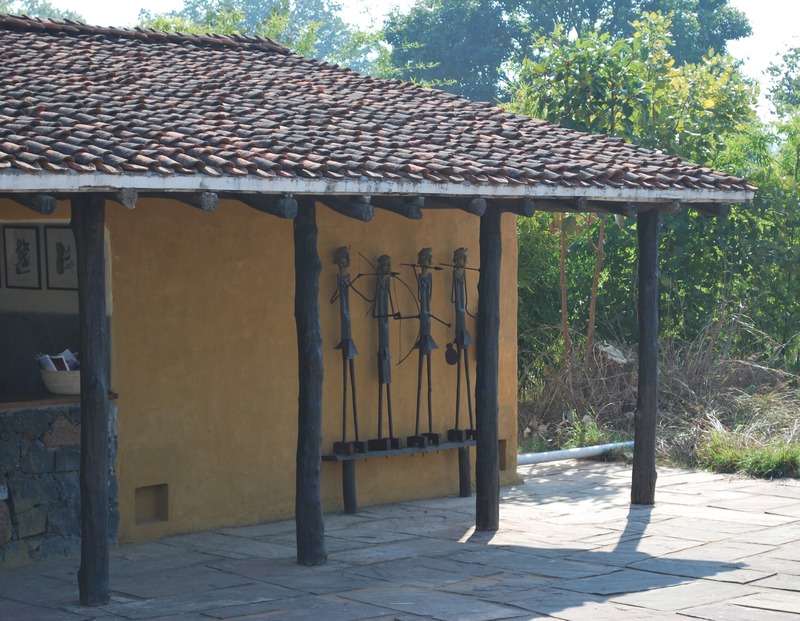 These wooden peg coat hangers can be found in every home in the village. 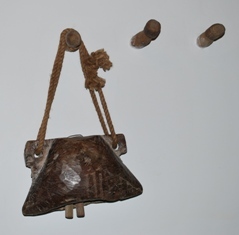 The wooden bell adorns the necks of cows so they remain within hearing range. 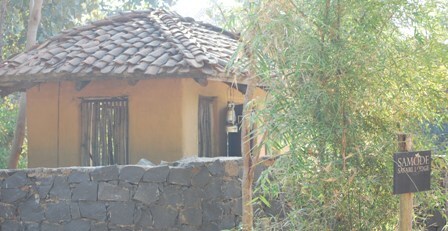 The wash rooms are delightful with an option of bathing indoors or under the open skies. They have traditional heaters powered by logs. 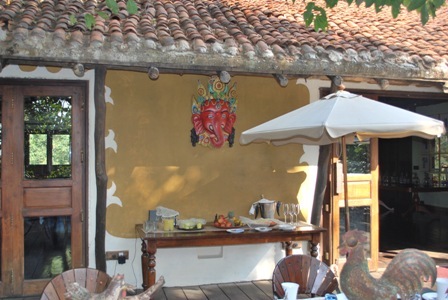 Food and drink are essential to a fun trip and can make or break properties. 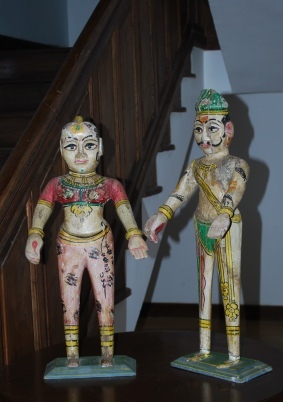 The painted wooden statues showcases the customs, society and fashionable attire of the people. The featured image of Lakshman with the bow is from the epic Ramayan. The name Bandhavgarh comes from him. 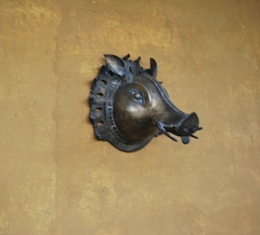 “Bandhav” meaning brother of Ram ( the perfect God Hero of the epic Ramayan) and “garh” meaning fort. 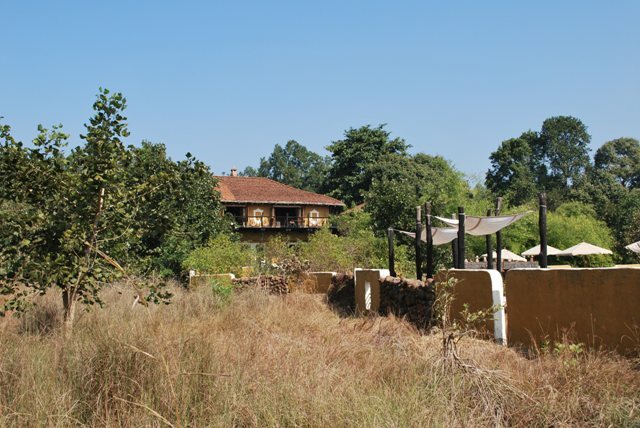 : bandhavgarh. 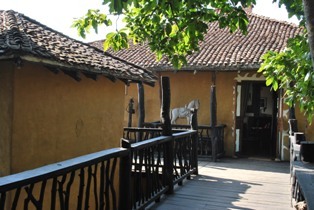 Walkway from the Main building to the Dining Room. 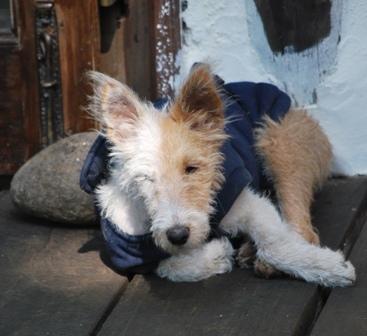 Best is to eat outdoors as the weather in December is divine. For those who do not wish to share with the inhabitants of the forest, the indoors is an option. will you share your plate with me ? The wooden beams are from a ship in Alang ( a port where old ships are broken up) in Gujarat. 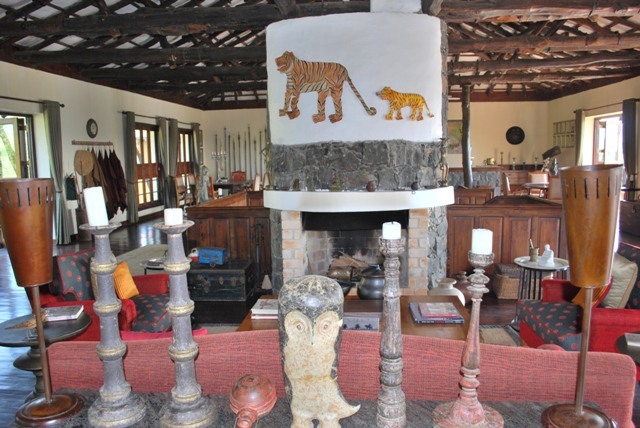 The interiors are aesthetically done incorporating many articles used in Indian homes to date. 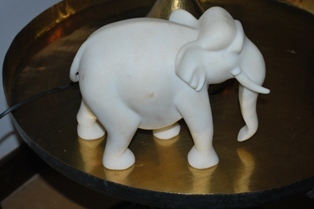 The table top is an Indian Thaali ( a large plate made of metal). 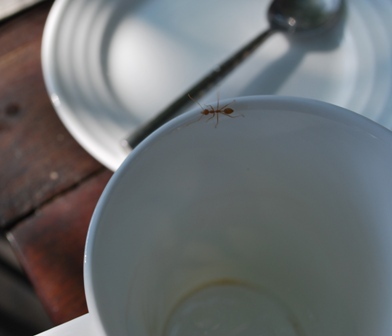 The food is then served in small bowls of metal placed on the plate. Each region in India has its own unique Thaali and food. 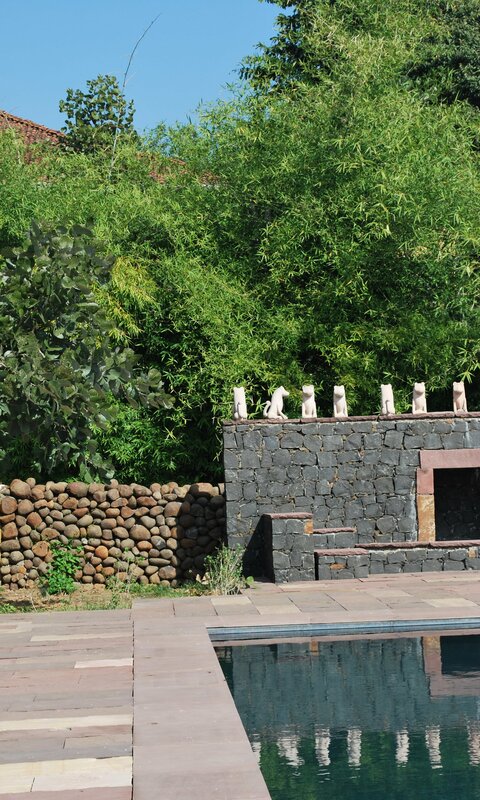 Lions ( or are they tigers) adorn the walls of the swimming pool. The walls made of stone are so much as in the village. The bar at the pool . 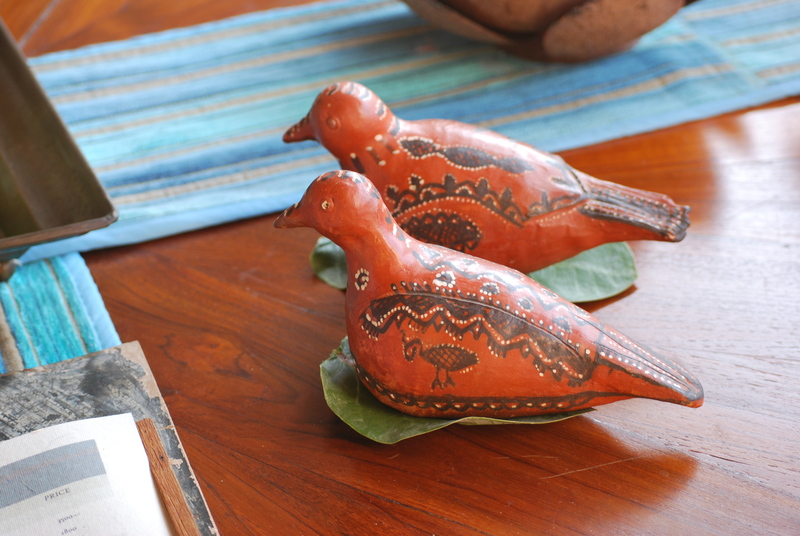 The metal figures are tribal craft at its best . 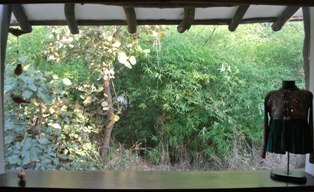 View of property from the Spa. The sails cover large beds near the pool. Many flowers bloom at this time of the year.Walking to the spa. 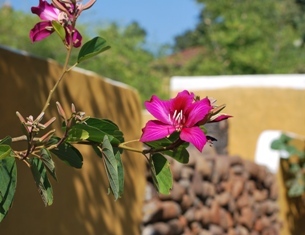 The spa is made like Indian homes of the past, with a large open courtyard forming the centre. 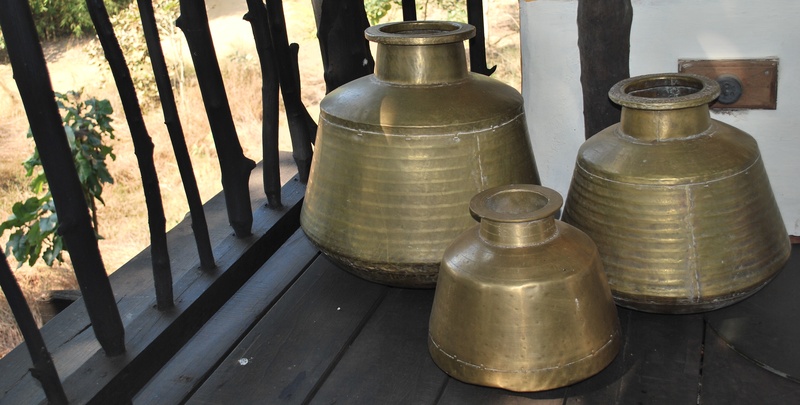 Villager carry water in such utensils. Lovely shapes and sizes. Care to detail is so important to the impression it leaves on the human mind. 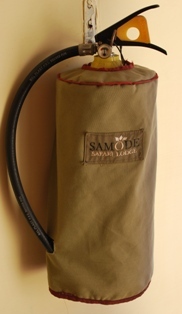 A fire extinguisher has a coat as well. 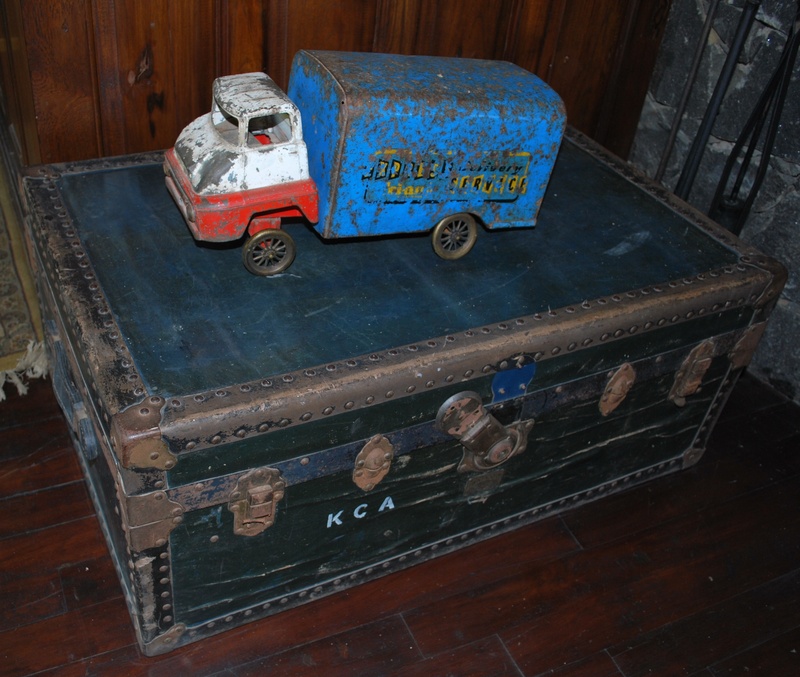 Suitcase packed and transport ready.